As Luck Would Have It, the latest from Spanish cult auteur Alex de la Iglesia (The Last Circus), is a cynical look at the media as told through a tragic, darkly comic tale of man on a bizarre death bed. Oddly compelling and superbly acted, the film is a more down-to-earth change of pace for those who got a jolt from the director’s more outré works such as Dance with the Devil or The Day of the Beast. Jose Mota and Salma Hayek try to make it work in As Luck Would Have It. Here, unemployed advertising executive Roberto (Jose Mota) gets into a freak accident at a newly excavated outdoor theater and winds up lying face up with an iron rod plunged into the back of his head. Enter the media in full frenzy, with his tale receiving 24/7 news coverage. And also enter a host of politicians, sleazy agents, TV executives and former co-workers who want to cash in on the tragedy, much to the contempt of Roberto’s dedicated wife Luisa (Salma Hayek, Savages). What adds some extra bite to the proceedings is the fact that Roberto, like the surrounding leeches, also wants to use his nefarious situation—the doctors can’t decide how to handle it—but for the sake of his family. He sees the situation as an opportunity to set up his wife and two kids, as well as alleviate his guilt over not working for two years. Penned by American screenwriter Randy Feldman (Tango & Cash), As Luck Would Have It may be set mostly in Madrid and Catagena, Spain, but the sharp swipes at the awfulness of the media is appropriate for all cultures. 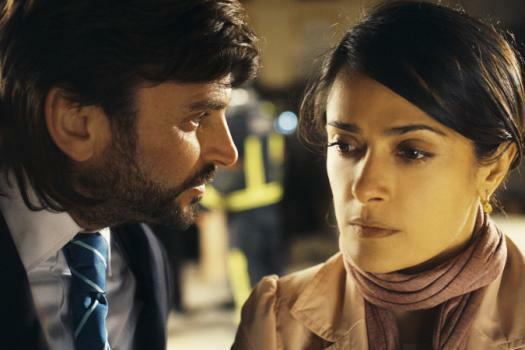 Along with strong performance from Spanish TV actor Mota and the always-game Hayek (in her best role in quite a while), co-star Fernando Tejero registers strongly as a sleazy agent continually negotiating on behalf of Roberto—and himself.